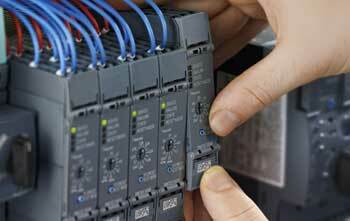 Within a given electric motor, the motor controller provides management of overall performance. It can be a single device or group of devices, and they may rely upon manual or automatic means for controlling the motor. The controls generally manage the starting and stopping of the motor, forward or reverse rotation, protection against any faults or errors, regulation or limitation of torque, and speed selection and regulation. Each motor controller will vary in its feature set and overall complexity based upon the nature of tasks assigned to the motor that it serves, but each does include some form of protection, especially overload relays that cut the power if the motor draws too much energy for too long. While the simplest model acts as a mere switch connecting a motor to a power source, more complex motor controls will work to control speed and torque as part of a closed loop control system. Examples include motor starters, adjustable speed drives, servo controllers, stepper motor controllers, and intelligent controllers that use microprocessors to control power.